Under the direction of the Grand Angoulême Conurbation Community and the Nouvelle Aquitaine public land-management institution, the Angoulême train station quarter is currently undergoing a major redevelopment project. 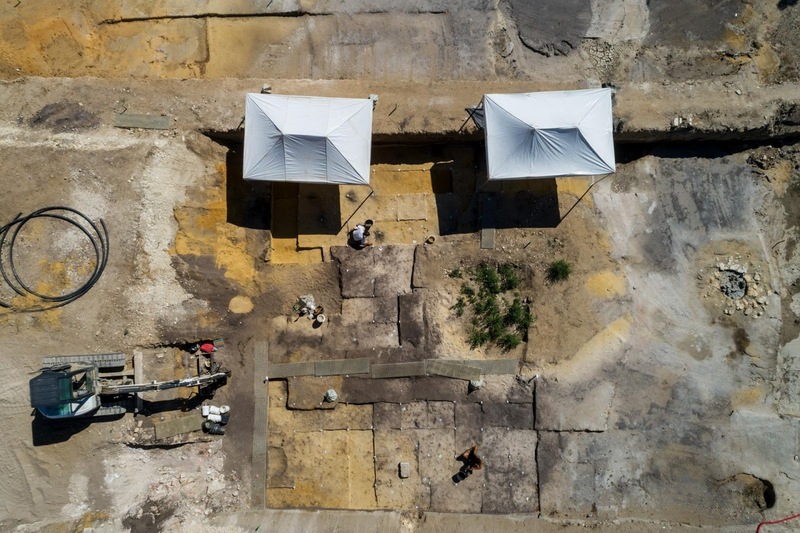 In this context, the State services (DRAC Nouvelle-Aquitaine) have prescribed a preventive excavation on the Renaudin Islet, located in a sector that is poorly known from an archaeological perspective. The prehistoric discoveries made at the site on the rue de Amiral Ranaudin have revealed archaeological levels associated with a sequence of tufas and peaty sediments at least three meters deep and attributed to the end of the Tardiglacial and early Holocene periods (end of the last glaciation, beginning of the current temperate period). This geological sequence, previously unknown in southern France, provides information on past climates and environments. 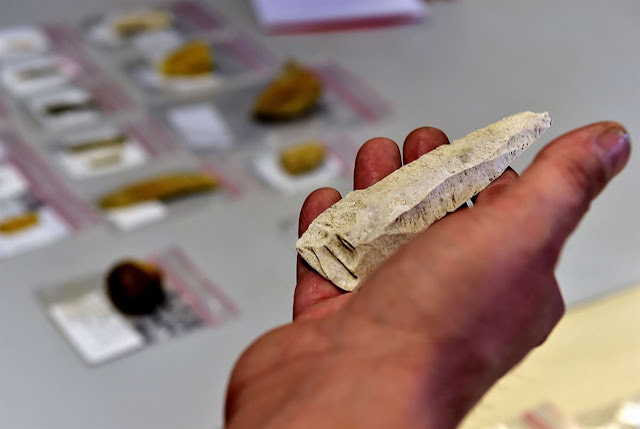 It is the source of the “exceptional discovery” declaration made in adherence to a specific procedure of the Heritage Code (article R523-48 du Code du patrimoine), validated by the Regional Commission of Archaeological Research and resulting in a second prescription by the State. 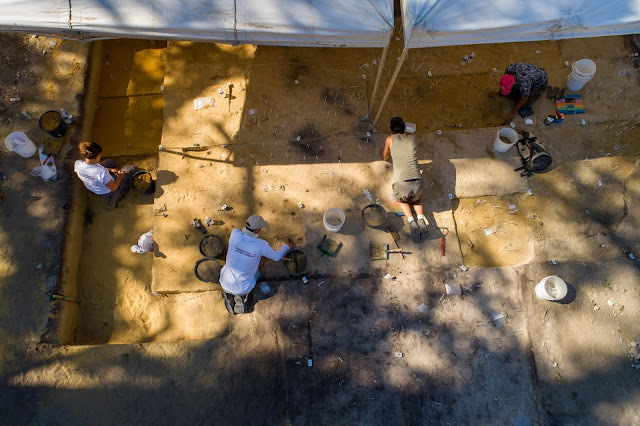 Across 2,000 m², the excavation area contains three prehistoric occupations within a paleo-channel bordered by tufas: one attributable to the Late Azilian (11,500 BC), a second one to the “Laborian” (9,900 BC), and evidence for Mesolithic occupations (8,900 BC). These prehistoric sites correspond to the transition from the end of the Upper Paleolithic to the Mesolithic, and between a cold climate and a warm one. The site, located in a valley bottom, is remarkably well-preserved despite erosion processes resulting in a vertical dispersion of artifacts and a colluviation of some horizons, notably the Azilian. The position of the site in this unique environment led to the fossilization of the prehistoric remains under a thick layer of tufa. The Azilian and Laborian levels are therefore stratigraphically well-defined. For the past seven months, a team of ten archaeologists has worked at this site, manually sifting 1,500 m3 of sediment. 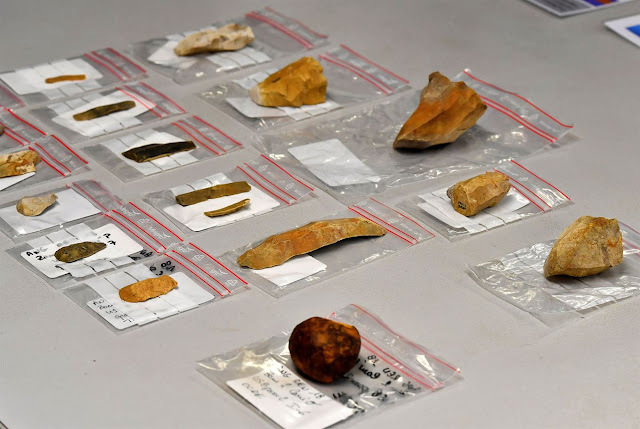 Approximately 200,000 artifacts, including 400 projectile armatures of varying types, have been recovered. 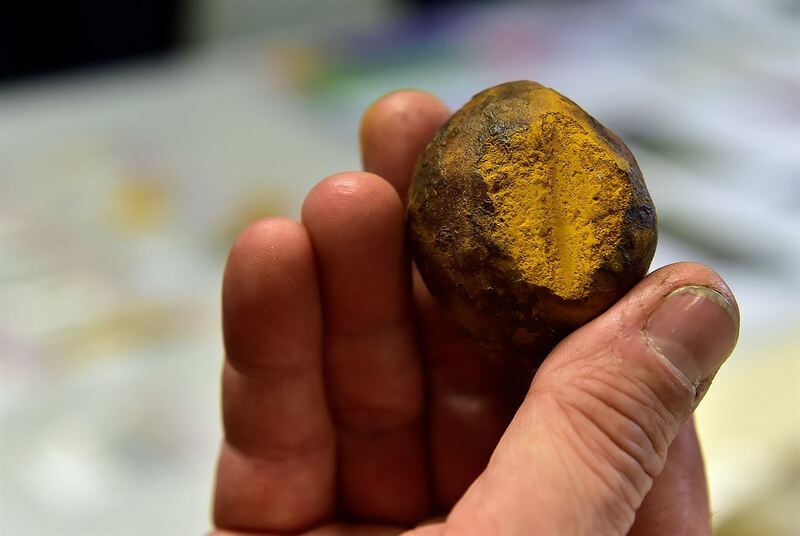 Working together, a malacologist, geomorphologist and tufa specialist, palynologist, and prehistoric technology specialists have achieved a better understanding of the field data. The Azilian is generally associated with a climatic warming following the last glaciation. Resulting changes in the available fauna and flora led to changes in human behavior. 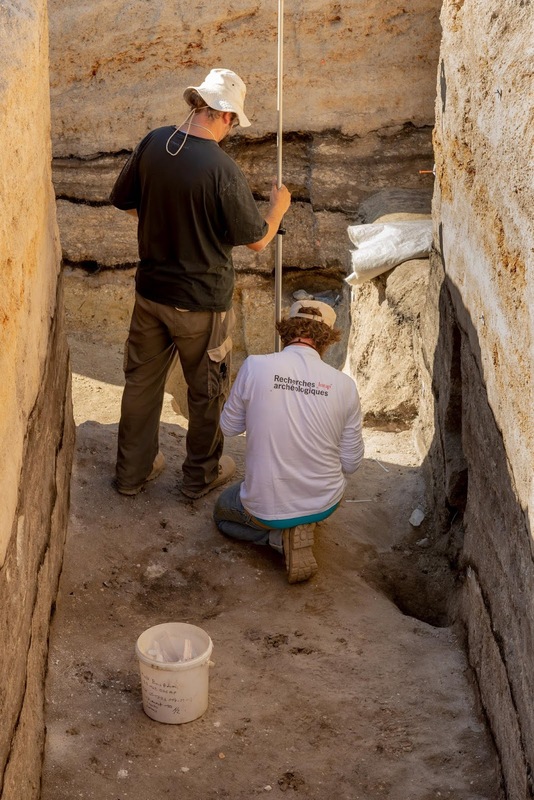 The occupation level extends across the entire excavation surface and is 40 to 80 cm thick. Well preserved features were uncovered, including four combustion features (fireplaces), concentrations of heated cobbles, bone remains and a flint working zone. It appears that the main goal of the flintknappers was to produce elongated flakes (laminar) to manufacture projectile points. 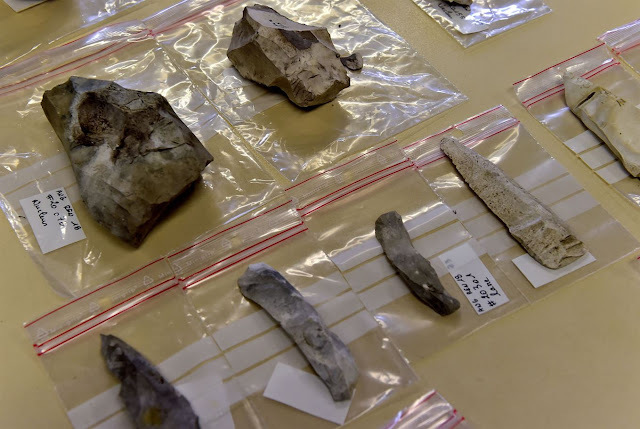 Most of these “points with a curved back”—small blades transformed into armatures at the site—display impact wear and fractures showing how they were used. 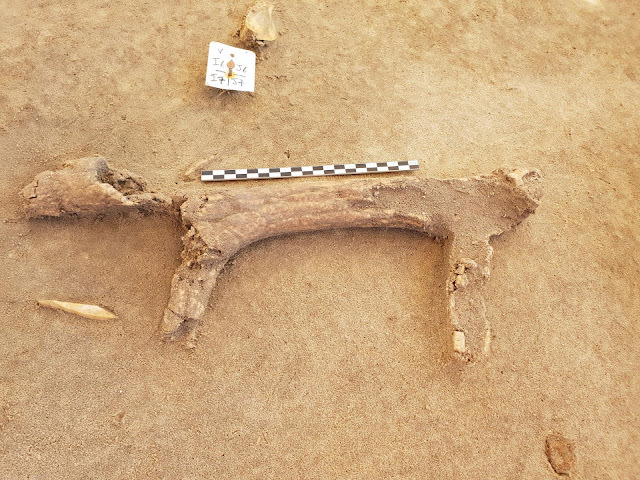 The fauna is also relatively well-preserved, especially cervid antlers and metapodials. 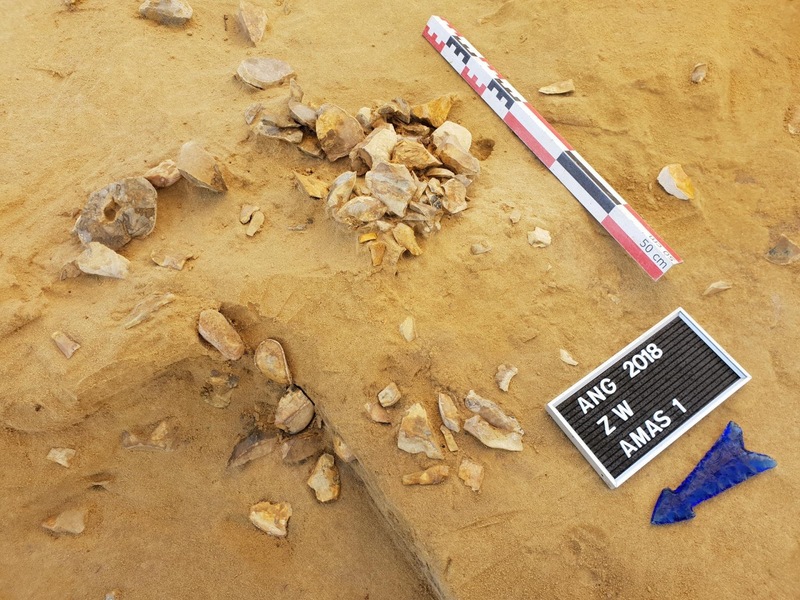 This Azilian occupation appears to have been a “hunting site” and a carcass processing and consumption site, as indicated by the domestic tools also discovered there (scrapers, retouched tools, etc.). In terms of climate, archaeologists often refer to this period as the “last cold snap”. Springs originating on the Angoulême plateau are responsible for the formation of a 3-meter-thick tufa dam that trapped the Laborian level “in place”. This culture, which follows the Azilian and extends across southern France, corresponds to a transitional chronological period, around 9,500 BC, which is currently found in the Charente region. 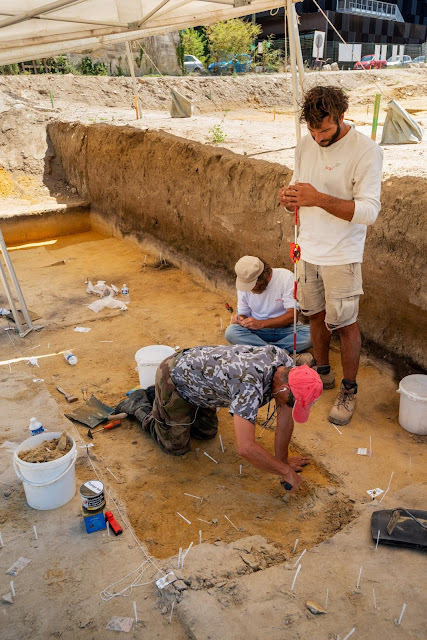 The excavation of the Laborian level sealed by tufa has uncovered combustion features, flint working zones and abundant new information on huntergatherers at the end of the Upper Paleolithic. The excavation of the islet has already revealed an activity zone via the discovery of long flint blades accumulated in proximity to horse bones, probably indicating butchering activities. 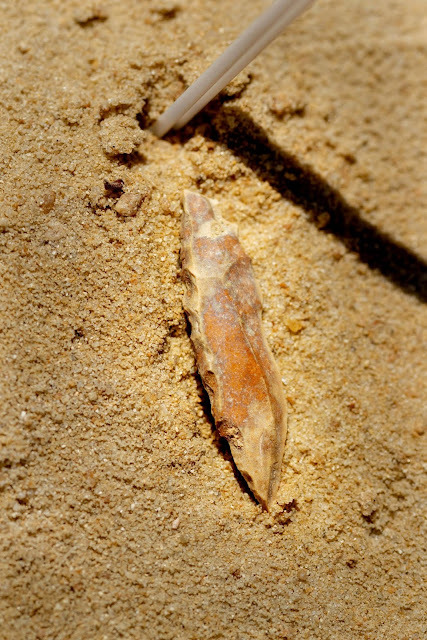 The lithic industry is covered with a light whitish patina indicating that the assemblage is homogeneous. It is mostly composed of projectile weapon elements made from small, narrow and regular blades; these are the “Blanchères points” and “Malaurie points” characteristic of this culture. A radiocarbon date situates this occupation at 9940+/- 40 BC. The paleoenvironmental data revealing a transition from a cold climate to a temperate climate provide an opportunity to better understand the concomitant climatic changes and technological transformations/innovations of societies at the end of the Paleolithic.